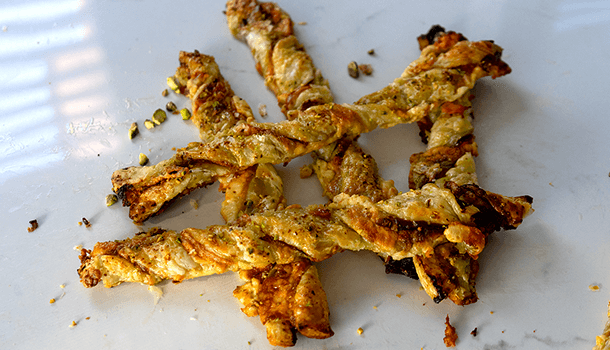 Cheese twists with pesto are crunchy sticks of goodness that everyone will love. With basil pesto and salty prosciutto, you’ll never buy boring breadsticks again. 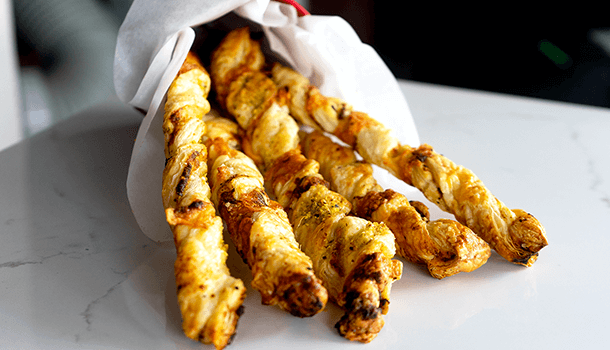 Best enjoyed right out of the oven, add these cheese sticks to your best antipasto platter. 1. To make the Cheese twists, place one sheet of baking paper on top of the chopping board. 2. 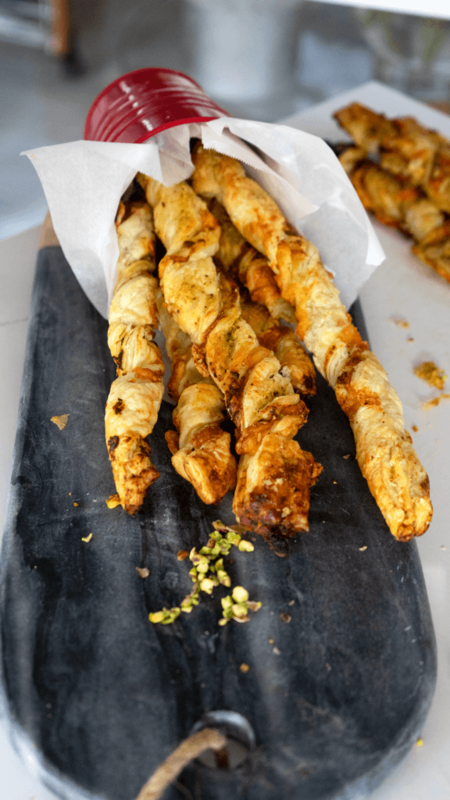 Place a sheet of puff pastry on top of the baking paper and drizzle extra virgin olive oil (EVOO) on top. Then, spread it all over the sheet using a pastry brush, covering each side. 3. Lather one side of the second sheet of pastry with EVOO too and put it to the side. 4. Get a generous scoop of Barilla basil pesto and put it in the middle of the pastry sheet. Then use the back of the spoon to lather the pesto all over it. VINCENZO’S PLATE TIP: Cheese twists are best served with a cheese that stretches once melted, my favourite is Provolone Dolce. 5. Next, lay the slices of cheese side by side, covering the whole sheet and using between 6-8 slices. 6. Place thin slices of prosciutto on top of the cheese before sealing it with the second sheet of puff pastry (making sure you have the side with oil facing down. 7. Now cover the pastry with a sheet of baking paper, and using the rolling pin, press down gently (rolling back and forth) so that it all seals together really well. VINCENZO’S PLATE TIP: If it’s a hot day, or you feel the pastry getting sticky, put it in the freezer for a couple of minutes as it’s easier to work with if it’s not too soft. 9. 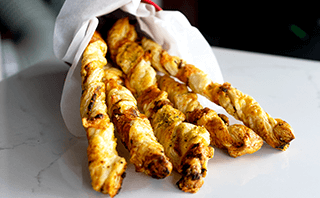 Use the pizza slicer (or a sharp knife) to cut the cheesy twist strips – making them approx. 3cm in width. 10. Place a strip on the baking tray and twist it by starting at the centre, and working down the ends next. Gently press any ingredients which may have popped out, back in. 11. Repeat this with each strip, and leave a gap between cheese twist as they’ll grow when cooking. 12. Put the tray of cheese twists in the oven at 200 degrees Celsius for 30 minutes, turning them once they have cooked for 15 minutes to keep each side nice and crispy! Enjoy with a Prosecco before you start a meal or as part of an antipasto/grazing board. They are best eaten straight out of the oven when they’re still hot and crispy, but can also be enjoyed cold.